Protein Blend (Whey Protein Concentrate, Milk Protein Isolate, Whey Protein Hydrolysate, Whey Protein Isolate), Alkalized Cocoa Powder, Natural and Artificial Flavor, Polydextrose, Sucralose, Gum Blend (Cellulose Gum, Xanthan Gum, Carrageenan), Salt, Papain, Protease. Contains Milk and Soy (Lecithin) Ingredients. This product contains whey and milk derived from dairy and lecithin (to improve mixability) derived from soybeans. Manufactured on equipment which processes products containing milk, eggs, soybeans, wheat, shellfish, fish oil, tree nuts and peanuts. Add one heaping scoop of RSP Whey in 6-8 oz. of cold water or any beverage of your choice. Mix until powder is completely dissolved. Do not exceed the recommended daily dose. Food supplements should not be used as a substitute for a varied diet. Keep out of reach of children. Protein Blend (Whey Protein Concentrate, Milk Protein Isolate, Whey Protein Hydrolysate, Whey Protein Isolate), Chocolate Cookie Pieces - Gluten free (Sugar, Rice Flour, Tapioca Starch, Potato Starch, Canola Oil, Alkalized Cocoa Powder, Salt, Sodium Bicarbonate), Natural and Artificial Flavor, Polydextrose, Sucralose, Gum Blend (Cellulose Gum, Xanthan Gum, Carrageenan), Salt, Papain, Protease. Protein Blend (Whey Protein Concentrate, Milk Protein Isolate, Whey Protein Hydrolysate, Whey Protein Isolate), Polydextrose, Natural and Artificial Flavor, Gum Blend (Cellulose Gum, Xanthan Gum, Carrageenan), Sucralose, Salt, Papain, Protease. Whey Protein Concentrate Blend, Milk Protein Concentrate, Whey Protein Isolate, Maltodextrin, Dutch Process Cocoa, Whey Protein Hydrolysate, Natural and Artificial Flavors, Purified Sea Salt, Sucralose, Acesulfame K.
Whey Protein Concentrate Blend, Milk Protein Concentrate, Whey Protein Isolate, Whey Protein Hydrolysate, Maltodextrin, Natural and Artificial Flavors, Chocolate Cookie Crumbs (Rice Flour, Sugar, Tapioca Starch, Palm Oil, Cocoa Processed With Alkali, Corn Starch, Salt, Chocolate Liquor, Natural Flavor, Sodium Bicarbonate, Soy Lecithin), Purified Sea Salt, Sucralose, Acesulfame K.
The cold ultrafiltration manufacturing process maximizes purity, solubility and bioavailabilty without denaturing or comprising the quality of the protein in RSP Whey. This process ensures it is easy to mix and digest while it feeds your muscles with premium quality protein. 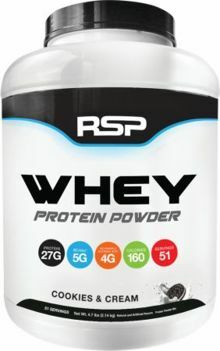 RSP Whey tastes amazing while still being low in carbs and fat. You can use it anytime - in everything from pre- and post-workout shakes or mixing it in meal replacements. Low fat. Low sugar. Low calories. Low sodium. Maltodextrin Free. Great taste. More of what you want, less of what you don’t. As with every RSP product, you can rest assured that what’s on the label is in the bottle. No amino spiking or playing games with any dosages. With RSP, you’ll get completely safe and effective products at great price in every encounter. Thanks for being a part of Team RSP. Live Inspired.